Business electricity users and householders were facing difficult decisions about their energy contracts, with wholesale prices dipping and some suppliers offering longer than usual fixed-rate deals, according to the Energy Advice Line. 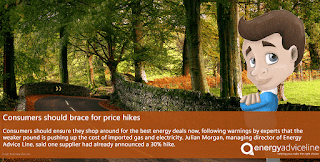 Julian Morgan, managing director of the price comparison, switching and advice service for energy users, said lower wholesale energy prices and increased competition were creating opportunities for customers to lock in good deals. But he said the trade-off for consumers who opted for longer-term price protection was potentially missing out on cheaper prices if energy costs continued to fall. “Consumers are facing some difficult choices at the moment and they need to take expert advice,” Mr Morgan said. “Some of the deals we are seeing are very attractive due to a dip in the price suppliers are paying for gas and electricity, and some of the benefits of a more competitive energy market starting to flow through. “Consumers will be tempted by these deals, as well as the opportunity to lock them in for up to four years, which is longer than usual. “But the flip side is that if energy prices fall further, which some experts predict that they will, consumers on fixed deals will miss out on those savings. The average dual fuel bill now stands at £1,265 a year, significantly more than the cheapest tariffs currently available over one, two, three and four-year fixed deals. But some experts say that cheap energy deals now on offer do not reflect current falls in wholesale prices, which could possibly drive down prices even further in the coming months. “At the end of the day it’s impossible to predict the future of energy prices, so householders and business energy users need to consider their priorities carefully,” Mr Morgan said. “For many people, the piece of mind of knowing that their energy tariffs will not skyrocket over the next few years is well worth the premium they pay for fixed-term deal, and the fact that they won’t benefit if prices fall. Mr Morgan said that although current market conditions presented consumers with a dilemma, the worst thing they could do was put their head in the sand when it came to energy supplies. “It can seem tricky to make the right decision, but impartial and independent services like ours can help,” Mr Morgan said. “We can guide householders and business owners through the benefits and disadvantages of fixed-term deals so that they can make the best decision for their budget and circumstances. The Energy Advice Line’s price comparison and switching service is free and completely impartial. 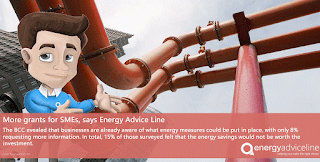 Consumers can obtain energy quotes with a few computer strokes based on a diverse panel of energy suppliers including the major players and smaller independent utility companies. 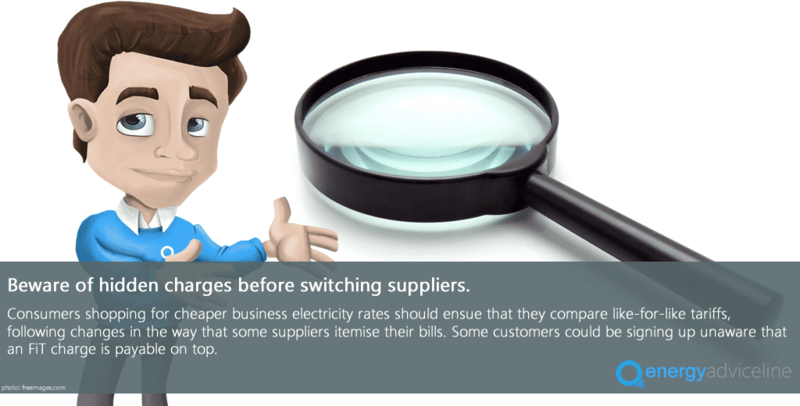 Consumers shopping for cheaper business electricity rates should ensure that they compare like-for-like tariffs following changes in the way some suppliers itemise their bills, according to the Energy Advice Line. Some customers could be signing up to deals unaware that a Feed-in Tariff (FiT) charge was payable on top. The FiT scheme was designed to encourage homeowners and businesses to invest in green technology such as solar panels and wind turbines. People who install the technology receive a subsidy and a guarantee that any surplus electricity will be bought back by the national grid. The subsidy is paid for by adding an extra charge onto the bills of those who don't install the technology. Up until recently, most suppliers just incorporated this into their unit rate so it was invisible. However, this is changing. The number of people taking advantage of the FiT scheme grew tenfold in 2012 and, combined with the fact that the subsidy is set high to encourage people to join up, there's heavy financial pressure on the system. It was only a matter of time before business electricity suppliers started itemising this as an extra charge, and some have started to do this. The crucial thing for consumers is to make sure that the price they are quoted for their electricity does in fact include this FiT charge, as we estimate that it adds a not-insignificant 2 - 3% onto a bill. When comparing energy prices, consumers need to be very careful that they are comparing like-for-like and ask suppliers whether the price they are quoting includes the FiT charge, or if it will be added on top. 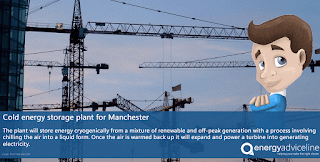 Manchester will be the home of a new cold energy storage plant as a new commisson shows. 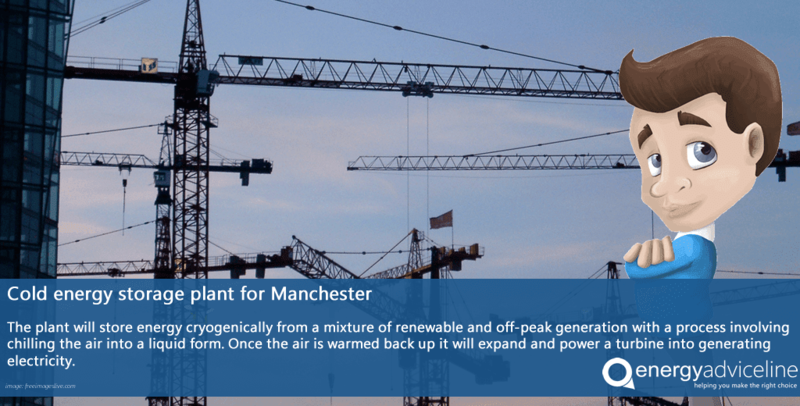 The plant will store energy cryogenically from a mixture of renewable and off-peak generation with a process involving chilling the air into a liquid form. Once the air is warmed back up it will expand and power a turbine into generating electricity. It is predicted that up to 5,000 homes could be powered for about three hours from the 5MW energy plant run by Highview Power Storage. The company believes that this technology has real potential and could be further improved for long-term use with green sources. As developments continue to be made with renewable energy, further stress is placed on the traditional method of energy generation and suppliers must to what they can in order to remain competitive. Consumers must remain vigilant when keeping an eye on their energy spend to ensure that they are receiving the best prices and that their supplier is keeping a competitive edge over all others. The Energy Advice Line is a service for both business and domestic customers that is both free and impartial. By allowing customers to check prices online 24 hours a day and seven days a week, there is no need to worry about whether or not you have the time to check out the market place. The free service carries out the whole process from beginning to end, and manages the switch for you. In uncertain times, you can rely on Energy Advice Line to provide a service you can trust, and to save you money. The volatile state of the current energy market has been highlighted within recent weeks, indicated by the collapse of GB Energy in November. As one of the new independent suppliers, GB Energy had 12 staff and around 160,000 customers on the database. But what caused their demise? 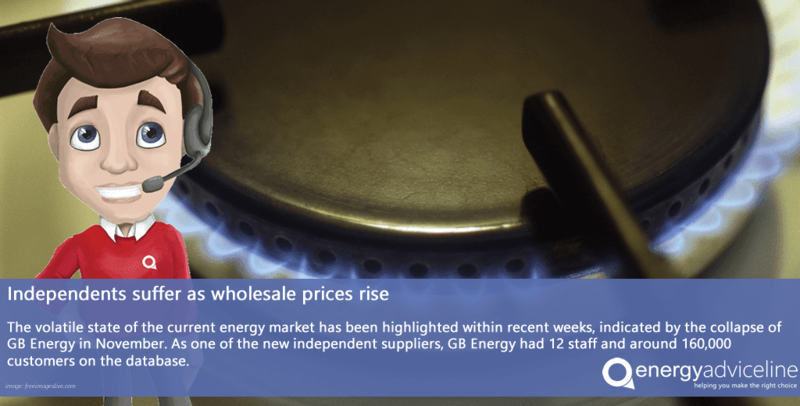 Wholesale prices have risen dramatically over the past few months and smaller energy suppliers are struggling to keep up with supply and demand. Industry analysts and experts predict that this will be an ongoing trend over the coming months and years for the new suppliers as they can't handle the rising costs of supplying their customers. Despite having a poor year, it looks as if the Big Six will start to see an increase on their market share with more independents dropping from the race. The UK government has encouraged the development of over 40 companies in the last five years due to their belief that the competition will help to drive down the overall cost of customer's bills. 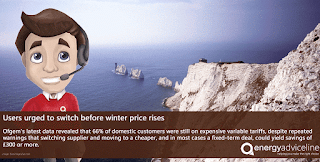 Weaker prices in 2014 allowed new suppliers to take advantage and offer more appealing deals to potential customers. 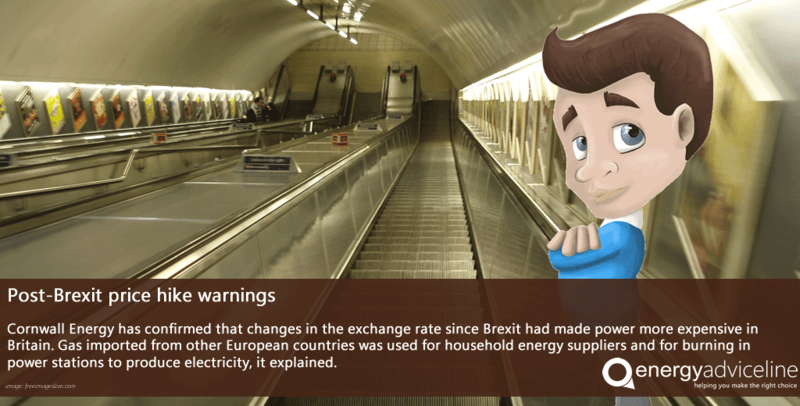 Prices were already on a steady rise in the UK following the trend of oil prices, however the decision to leave the EU resulted in higher costs for importing gas, coal and electricity. Four of the Big Six energy suppliers are owned by companies in mainland Europe, so it is currently believed that their prices may not be too drastically affected. EDF is French, EON is German, Scottish Power is part of a Spanish company, and NPower run by a company in Germany. Power supplies are tightened heading into winter as demand rises. How this will affect prices for consumers is yet to be seen. As winter draws in and energy bills start to creep up, a list has been published that highlights the ten worst energy deals on the UK. Four of which are misleadingly labelled as a 'standard' tariff. Four of the Big Six energy companies feature on the list where independent supplier Co-operative Energy sits in the number one spot with their 'Green Pioneer' tariff. Npower, Scottish Power, SSE, and EDF are the four Big Six companies named and shamed this month. Pay as you go customers are still in the dark as to how their tariff truly measures up as this research only takes into consideration those on contracted prices. Co-operative energy came in at the top of the list with a total cost of £361 per year than the cheapest tariff on the market. Overall an estimated total of 2.3 million people are using these ten tariffs, and are typically higher priced as they require the customer to pay by cash or cheque, rather than the cheaper option of monthly direct debits. Julian Morgan, managing director of the price comparison and switching service, Energy Advice Line, commented, "It's more important than ever for consumers to not only be aware of the price that they are apying, but also how their chosen method of payment can affect their overall annual spend. "It's reached that time of year where bills start to rocket due to the colder weather and turning on the central heating. Be sensible with your temperatures and don't find yourself landed with a large bill out of the blue." 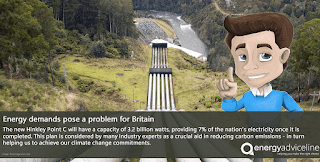 The Energy Advice Line provides a service that is not only free, but also completely impartial. Advice is available for both business and domestic customers that may need assistance in understanding their bills, or finding the best rate. Millions of businesses and households were missing out on substantial savings on their energy bills because they assumed they were on the cheapest tariff without actually checking, according to the Energy Advice Line. 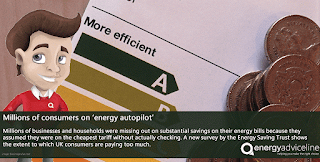 Julian Morgan, managing director of the price comparison, switching and advice service for energy users, said a new survey by the Energy Saving Trust showed the extent to which UK consumers were unaware they were paying too much. The survey found thatm ore than 13 million British households missed out on savings last year because they didn't switch suppliers. 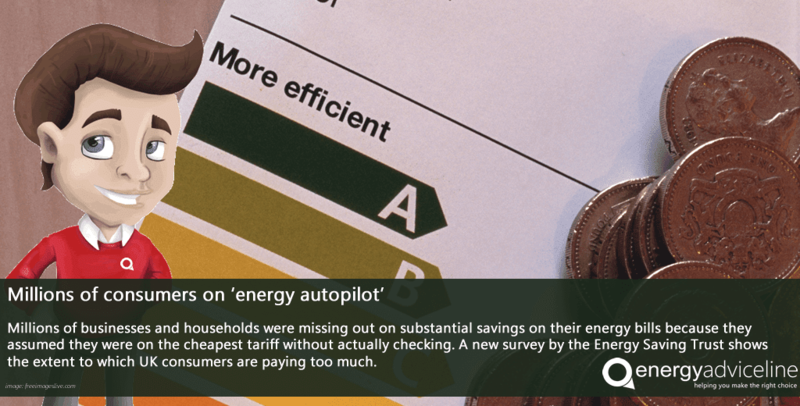 It also revealed that a large number of consumers were on 'energy autopilot', with nearly 60% of non-switchers believing they were on the cheapest tariff available, which the Trust said was unlikely. "This is further evidence that many businesses and households are missing out on substantial savings on their energy bills because they wrongly assume they are on the cheapest tariff," Mr Morgan said. "The truth is that energy prices are always fluctuating and suppliers are constantly changing their fixed and non-fixed deals. "This means that no-one can assume they are on the cheapest tariffs without shopping around on a regular basis, and switching supplier accordingly." 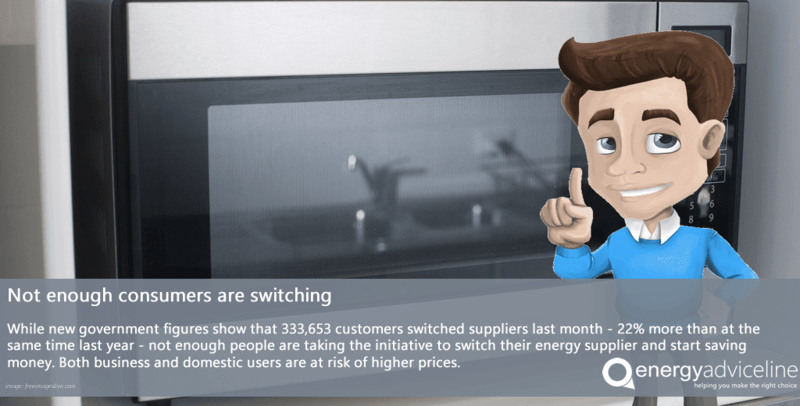 Recent figures from the enegry regulator Ofgem show that households can save around £300 each year just by switching suppliers, yet the majority of consumers fail to do this. In fact, the Energy Saving Trust survey showed that consumers were more than twice as likely to change home insurer than energy provider, with only 24% oh households having switched at least four times in the past decade. "These figures should really trigger alarm bells with Ofgem and the government, and prompt them to do more to encourage consumers to shop around and switch," Mr Morgan said. 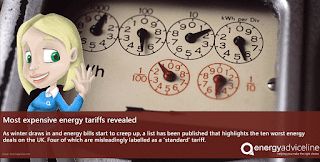 "Bill and tariffs are still too complex for consumers to be able to compare deals easily, so more needs to be done to make it as simple to switch their energy supplier and their insurer. "The government also needs to drive home the message that the savings to be made from switching supplier regularly really are substantial. "Mostp eople wouldn't contemplate throwing £300 down the drain - yet this is what they could be doing by not being pro-active when it comes to their energy supplies." Consumers should ensure they shop around for the best energy deals now, following warnings by experts that the weaker pound is pushing up the cost of imported gas and electricity, according to the Energy Advice Line. Julian Morgan, managing director of the price comparison, switching and advice service for energy users, said one supplier had already announced a 30% hike for around 70,000 of its customers. GB Energy Supply, a new supplier that entered the market in January last year, recently announced it would increase average annual bills from £820 to £1,060 for customers on its standard variable deal. In August, OVO Energy announced a 3.6% increase and Co-operative Energy put up prices by 3% in October. Industry analysts have predicted that other suppliers will follow suit. Samuel Tombs, chief UK economist at Pentheon Macroeconomics, was reported last week as saying that bills could go up by 5% in the short term and 15% over a longer period. This was in response to the wholesale costs for gas and electricity jumping by 20% and 50% respectively since the summer. "It's now time to act without delay," Mr Morgan said. "Consumers need to shop around to get the best deals. 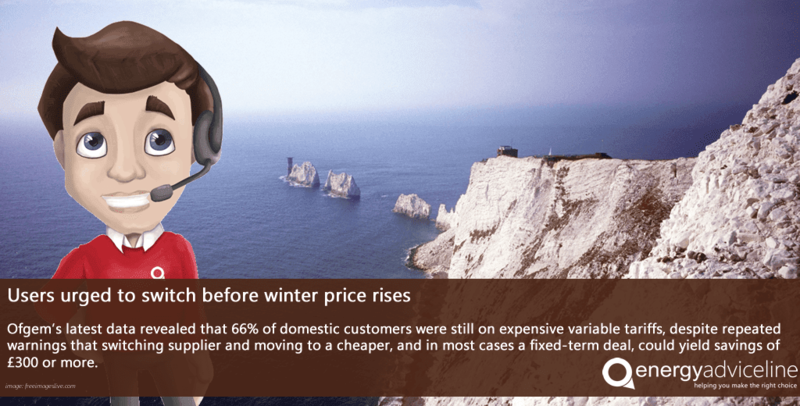 "The trend is upward for energy prices and consumers need to be pro-active to protect themselves from nasty surprises as the cold weather sets in. "It's widely expected that the Big Six suppliers will raise their prices this winter, with potentially further price hikes to come down the track." Mr Morgan said that consumers should shop around and consider locking themselves into fixed deals while they were still available. Although prices were generally on the rise, there were still very good competitive deals available. "The potential savings to be made through switching are significant, particularly if you have never switched before, or haven't done so for a while," Mr Morgan said. "Ofgem estimates consumers can save £300 annually but it very much depends on how often you switch. "For those consumers on a standard energy tariff - by far the most expensive - the savings to be achieved by switching could be even more than £300 annually. "And even for the very small minority of customers who switch suppliers regularly, shopping around is still well worth doing, even though the savings will be less." The Energy Advice Line has welcomed hints from Prime Minister Theresa May that she will tighten rules governing energy prices and even extend price caps to protect more consumers. "We welcome any measures that will bring suppliers into line and ease the burden on energy consumers," said Julian Morgan, managing director of the price comparison, switching and advice service. "Suppliers have had ample opportunity to get their houses in order and start giving consumers a fair deal when it comes to prices. "Although there have been some improvements, suppliers have continued to increase tariffs for some consumers by unreasonable amounts, in the face of falling wholesale prices. The government will now have to force their hand." 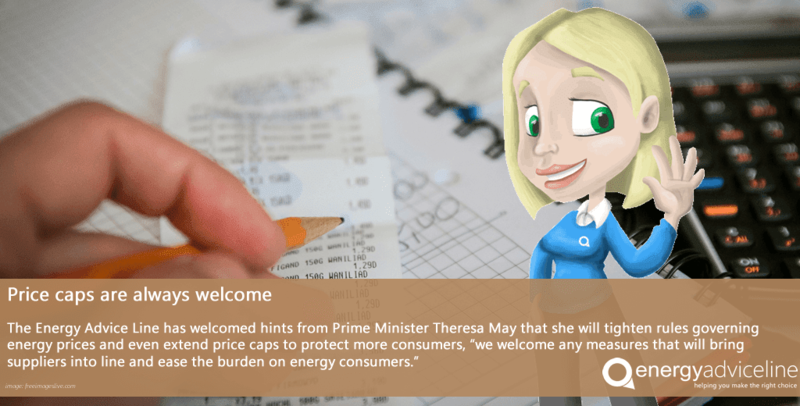 Following a two-year investigation into the UK's energy market, the Competition and Markets Authority (CMA) will soon introduce price caps for four million households that use pre-payment meters. The CMA's original proposals in 2015 would have protected more households, however, then Prime Minister David Cameron watered these down, and resitricted price caps to the most vulnerable energy users. But Mrs May signaled at the Conservative Party Conference earlier this month that this protection did not go far enough. "It's just not right that two-thirds of energy customers are stuck on the most expensive tariff," she said. Mrs May was referring to the vast majority of energy consumers who do not switch contracts or suppliers, remaining instead on standard tariffs that can be hundreds of pounds more expensive than the cheapest fixed deals. "Huge number of consumers languish on the most expensive standard tariffs because suppliers do little to persuade them to move to something cheaper,"
Mr Morgan said, "After all, suppliers make most of their profits from customers who do this. "Although it's also the responsibility of consumers to shop around for their energy and switch to the cheapest tariffs, suppliers should not be allowed to take advantage of those who don't. "That's why we would welcome the extension of price caps to protect more consumers." Mr Morgan added that the introduction of price caps would not obviate the need for consumers to shop around for energy. "Shopping around for the best deals and switching suppliers accordingly will always lead to bigger savings than doing nothing and resorting to the protection of a price cap," Mr Morgan said. Spain will become one of the first countries to be powered 100 per cent by renewable energy - with 29 million of its homes currently being run on wind power alone. Located in Pamplona, the firm currently monitors 9,500 wind turbines across the world. Last November saw a new nighttime record where wind energy provided 70 per cent of the country's energy supply. Prior to that the daytime record was set in January 2015, during this time 54 per cent of the energy used in Spain was produced by wind power alone. 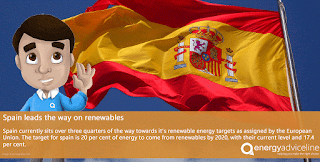 Spain currently sits over three quarters of the way towards it's renewable energy targets as assigned by the European Union. The target for spain is 20 per cent of energy to come from renewables by 2020, with their current level and 17.4 per cent. As with any story on energy news, specifically renewables, critics have been quick to point out the flaws. Focussing on renewables has, thus far, not made any impact on the affordability of energy. Some have suggested that there has been a 60 per cent price increase over the past 10 years. Consumers can still save money if they are savvy with their energy useage, and making sure that they are always on the most competitive tariff. Saving on energy doesn't just come from making sure your lights are turned off, you may be paying over the odds just for remaining loyal to your supplier. Recent studies have shown that in some cases the best deals are only available to new customers - meaning there is no benefit or discount for remaining loyal to a brand. Make sure that you are always paying the best prices on the market for your energy by comparing the market with energyadviceline.org.uk. The free and impartial comparison service also offers a free energy advice line to business consumers. 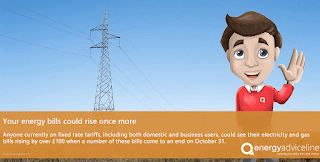 A number of fixed tariff deals will be coming to an end on October 31. Anyone currently on these tariffs, including both domestic and business users, could see their electricity and gas bills rising by over £100 from next month. Deals such as these expire all the time, which is why it is always important to keep an eye on your bills and be aware of when your contract is about to come to an end. Allowing your contract to rollover means you stand being charged at the out of contract prices - these prices are a lot higher than the rates used to bring in new customers, and many families and companies find themselves stung by a bill much higher than it should be. The best way to combat this is to make sure you switch your deal to something more competitive. Brand loyalty doesn't always pay so don't be afraid to swap your supply to someone new. The tariffs ending this month include EDF energy's Blue+ Fixed PrePay, Scottish Power's Online Fixed Price, and a selection of First:Utility's iSave Fixed tariffs. Not sure if these changes apply to you? Take a look at your last bill and find out your current contract details. Unsure of how you can start saving? Is the market too unclear for you to make the best choice? Give the energyadviceline a ring and find out just how easy it is to start saving on your energy tariff. Consumers who switch stand to save hundreds of pounds every year. The World Energy Council has released their predictions this week that the global demand for energy will reach its peak by 2030. This is thanks, in part, to a combination of new technologies entering the market and governments creating stricter policies. 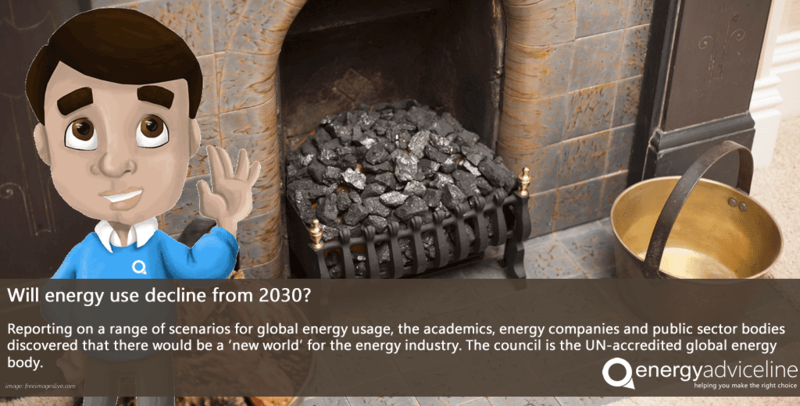 Reporting on a range of scenarios for global energy usage, the academics, energy companies and public sector bodies discovered that there would be a 'new world' for the energy industry. The council is the UN-accredited global energy body. They presented the findings at the World Energy Congress in Istanbul, along with the predction that after the year 2030, energy usage will decline per person - including transport fuels, heating and electricity. Thanks to developments in technology for the sector, use of renewable energy is growing and anticipated to grow faster as coal and oil will start to fade away. The group indicates that while 4% of power generation comes from renewables, this should be approximately 39% by 2060. While these demands will fall, the report also shows that demand for electricity will have doubled by 2060, which requires a greater investment in the infrastructure systems that promote energy efficiency. Three scenarios were proposed by the council that would enable the assessment of different energy use areas. These options see the use of fossil fuels ranging from 50% to 70% of energy by 2060. Developments such as electric cars instead of petrol and diesel will help this progress, but is thought to be one of the most difficult obstacles in the plan. However two of them theorise that oil production will peak and beging to fall in 2030, with the third predicting it to plateau until 2040. Currently oil powers 92% of vehicles with this expected to fall as low as 60% with the rise in electric powered motors. It was also reported that maintaing global warming below 2C requires an 'exceptional effort' which would be far beyond the commitments that have already been pledged. To accompany this reduced demand they also predict that the growth of the population will slow down, new technologies will be developed, environmental challenges will grow, and a change in economic and geopolitical power. Trouble getting the cheapest deals? 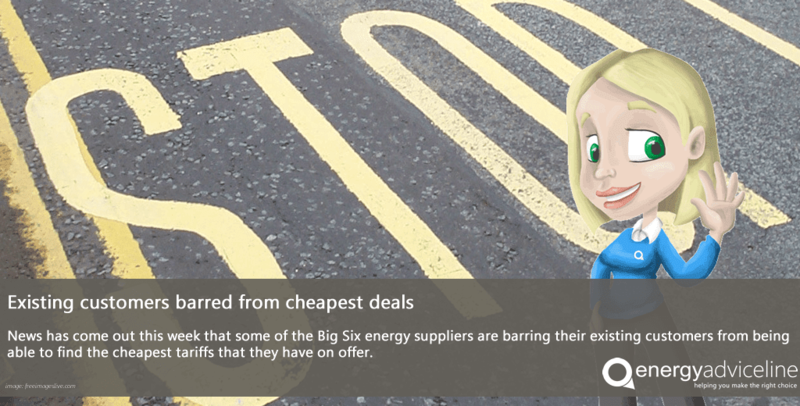 News has come out this week that some of the Big Six energy suppliers are barring their existing customers from being able to find the cheapest tariffs that they have on offer. Having been uncovered by Radio 4's 'Moneybox' programme - researchers have found that E.ON, EDF, SSE, and British Gas have ensured that their existing customers are unable to make the most of the cheapest prices they offer to new customers. 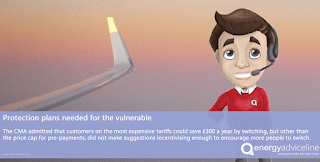 These tariffs for existing customers can end up costing hundreds of pounds a year more than if they were to switch onto a more competitive tariffs designed to attract new customers. 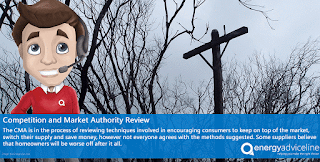 Previously, this type of practice was ruled as unfair and banned by the industry regulator Ofgem in April 2014. 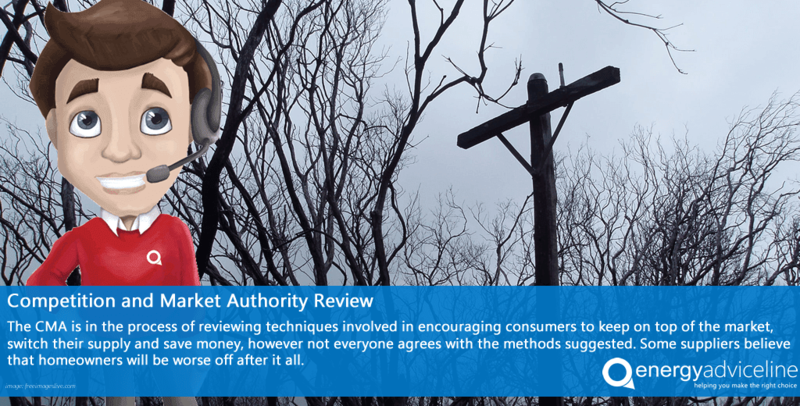 Earlier this year Ofgem announced that they would no longer be reinforcing this rule after a recommendation from the Competition and Markets Authority (CMA). Comparison agencies have compared the prices by either renewing as an existing member of the supplier, or registering as a new one, and with E.ON this price difference came in at £260. But E.ON is not the only one to employ this tactic. These tariffs have also been shown to be hidden from other services such as the Energy Helpline because the information provided will rule them out of being a new customer with the existing supplier. However, currently the consensus is that the other Big Six suppliers will not follow in the direction of their competitors. Scottish Power released a statement to say that they will not be offering these sorts of tariffs, stating that their customers can switch freely between the different tariffs on offer. The best way to ensure that the price you are paying is competitive is to take on the advice of an unbiased and neutral help line, such as the Energy Advice Line. The leading price comparison and switching service provides free advice, and if you wish to change your supplier they will do all the hardwork for you from initial sign up through to completion. The Energy Advice Line has welcomed new figures showing a 30% increase in the number of consumers changing suppliers in the first half of this year. But Julian Morgan, managing director of the price comparison, switching and advice service for energy users, said more needed to be done to incentivize consumers languishing on standard variable tariffs. "We certainly welcome the fact that more and more consumers are heeding the message that they need to switch supplier to save money on their energy bills," Mr Morgan said. "But there are still worrying numbers of householders paying over the odds because they're on standard tariffs - the most expensive way to pay for your energy. "This significant core group of consumers needs to be targeted by the government and the energy regulator, and ways found to encourage them to change their habits so they don't continue to waste money by paying more for their energy than they need to." Ofgem recently published new figures showing that more than 3.8 million UK households switch supplier in the first half of 2016 - around 1 million more than in the same period last year. Of these, around 1.6 million domestic customers switched gas suppliers and 2.2 million domestic customers switched electricity suppliers. The data also shows that consumers have more choice than ever, with over 40 suppliers now competing for their business. However, Ofgem's data also revealed that 66% of domestic customers were still on expensive variable tariffs, despite repeated warnings that switching supplier and moving to a cheaper, often fixed-term deal, could yield savings of £300 or more. "Ofgem claims that introducing reforms recommended by the Competition and Markets Authority (CMA) earlier this year to better protect those on pre-payment meters and increase competition for all other customers, would encourage more people to switch," Mr Morgan said. "However, their own figures show that much more needs to be done. There are some great deals out there, and more suppliers than ever to choose from, yet many people are either unaware of this and how much money they can save, or believe it's too difficult. "Ofgem needs to drive home the message that, with winter coming, consumers need to be active when it comes to their energy suppliers and seek out savings." To encourage more switching, Ofgem plans to trial "more effective prompts" on customer's bills to encourage them to compare different tariffs. But the regulator has ruled out capping standard variable tariffs. When did you last check your meter? 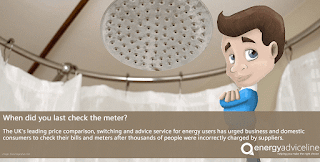 The UK's leading price comparison, switching and advice service for energy users has urged business and domestic consumers to check their bills and meters after thousands of people were incorrectly charged by suppliers. Energy regulator Ofgem has revealed that customers whose metric gas meters, measured in cubic meters, were read as imperials (in cubic feet) and had been charged too much. 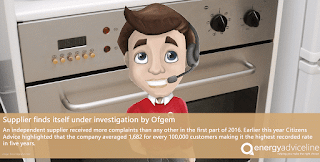 Ofgem has asked suppliers to investigate how many customers have been affected. Julian Morgan, managing director of the Energy Advice Line, said the revelations proved how important it was for customers to always supply meter readings, to check the readings against bills and to query any anomalies. "It could well be that the thousands of customers believed to have been affected by this error could have done nothing to prevent it," Mr Morgan said. "But it proves that suppliers do indeed make mistakes and that customers need to be pro-active when it comes to energy. "Faulty meters, incorrect readings and human error - unfortunately all these things do happen and can lead to significant overcharging. At the end of the day, consumers need to be vigilant." The meter reading errors were identified by energy giant E.on earlier this year, prompting a wider prove into how many people have been over or undercharged. Ofgem has said it believes that 'a very small number' of gas customers had been affected - around 6,300 people - but that suppliers had been asked to investigate and report back. The regulator said that customers did not need to do anything because suppliers would contact those affected. But Mr Morgan urged customers to check with suppliers themselves just to be sure. "Given the track record of suppliers when it comes to being upfront about mistakes, we recommend that customers with a gas meter who feel they might have been overcharged to contact their suppliers and ask for their bills to be checked. "It could well be that some affected customers have slipped through the net. "Even with the national rollout of smart meters, which are designed to deliver real time meter readings from homes and businesses, consumers need to take care. "Mistakes happen and technology can be faulty." E.on has apologised and confirmed that around 350 residential and small and medium-sized enterprises (SMEs) would be refunded and compensated after the problem was discovered. The Energy Advice Line has joined the chorus of energy experts warning that household and business energy prices could be about to rise, driven partly by the Brexit vote. 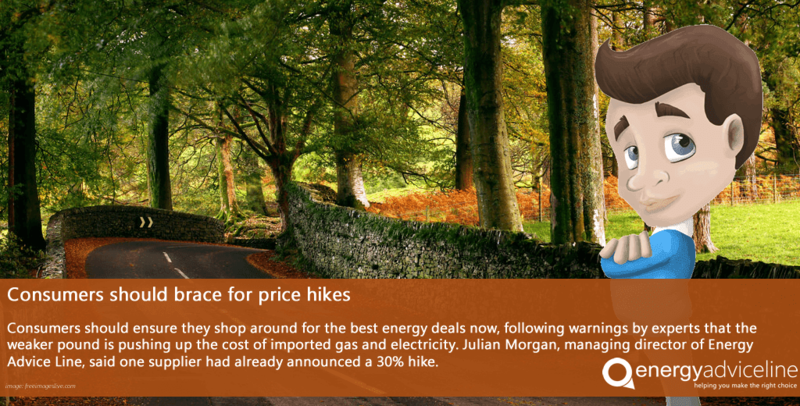 Julian Morgan, managing director of the price comparison, switching and advice service for energy users, said the Co-op had already advised that it would be raising bills by between 3% and 6% from October 1 - representing an increase up to £70. "Not only has the wholesale price of gas risen steadily over the past three months, but the value of sterling has fallen against the euro, representing a double whammy for British consumers," Mr Morgan said. "This means thast as well as the wholesale price of energy rising, imports are 10% high still due to currency fluctuations. "The Co-op has signaled that the average bill for dual-fuel customers on a standard plan will rise from £1,152 to £1,184 a year, while people with pre-payment meters could find their bills rising from £1,115 to £1,184. "This is worrying and could be a sign that other suppliers are about to follow suit." Independent energy consultant Cornwall Energy has confirmed that changes in the exchange rate since Brexit had made power more expensive in Britain. Gas imported from other European countries was used for household energy suppliers and for burning in power stations to produce electricity, it explained. Mr Morgan said this meant that suppliers, especially smaller companies unable to buy their energy as far ahead as the Big Six, would inevitably pass on these extra costs to consumers. "The only thing consumers can do is to fight back and switch suppliers," Mr Morgan said. "Despite the overall upward trend, good deals are still available, even as we head into winter. It's crucial that consumers shop around - ideally come to us for advice about the best deals available." Even without the upward pressure on energy bills, Mr Morgan said, the Competition and Markets Authority recently concuded that customers who stayed on the most expensive standard tariffs were collectively wasting as much as £1.7 billion a year. "It makes complete sense to regularly switch supplier and seek out the good deals elsewhere, regardless of what's happening to wholesale energy prices and the exchange rate," Mr Morgan said. The Energy Advice Line is one of the UK's leading price comparison and switching services for business and domestic energy customers. It is also an advocate for energy reform and has campaigned for a better deal for energy users, uncluding calling for a ban on cold calling and changes to regulations to make it easier for all consumers to switch suppliers. 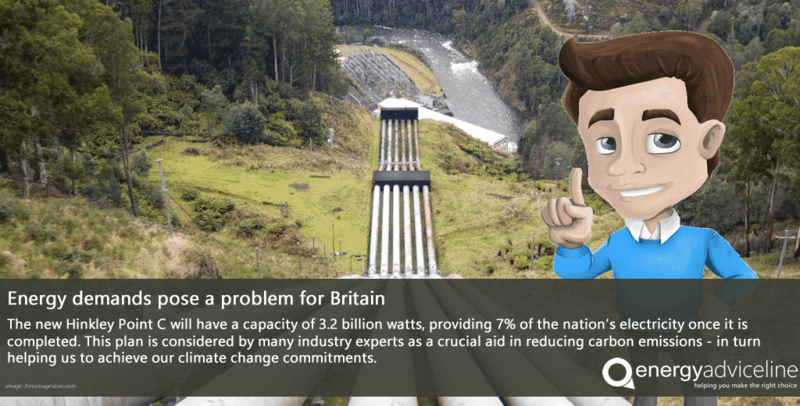 Is the UK at risk of energy shortages? As cooler weather begins to roll in the talk of energy shortages and blackouts has returned. However, this year it is reported that our smart energy revolution can help to combat the issue, according to the UK chief of the National Grid. Nicola Shaw has commented that an 'internet of energy' will help our white goods balance the demand on our energy supply. Whereas counter arguments have formed saying that what the UK really needs is more power generated from gas as a back up this winter. Shaw believes that supply can be managed simply by UK households changing their demand patterns. She agrees that gas power could help, but doesn't not agree that it's the way forward. Statistics show that between 30% and 50% of energy fluctuations could be smoothed out by both households and businesses adjusting their demand during peak times. 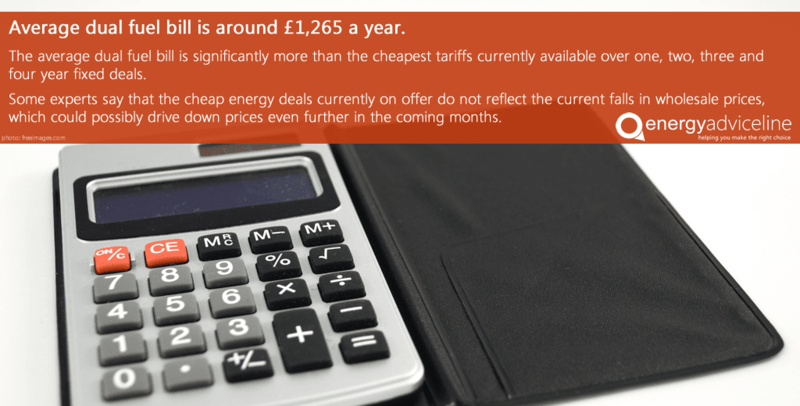 Many energy suppliers currently offer cheaper prices outside of peak times, such as after midnight and before 8am. This doesn't suit most businesses, but households can adapt where possible to help make small savings. A firm in Cornwall has created an incentive for it's customers to use more power when the sun is out thanks to the extra solar power. Speaking to BBC News, Shaw stated "we are at a moment of real change in the energy industry", meaning that the large energy organisations are now mostly using solar power in order to generate their supply. 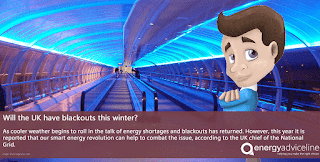 People are already changing their energy usage in order to place less pressure on the system, and it's this smart usage of energy that will help us to avoid any unnessecary power cuts and blackouts this winter. Embracing 'smart energy' and being wise about your spend will help the industry to progress into making new discoveries about how the country can be powered. If you're ever unsure about the figures on your bill then simply pay a visit to energyadviceline.org.uk - businesses and homeowners can receive free energy advice. The Energy Advice Line has called for the government to provide more grants to cover the installation costs of energy efficiency measures. Mr Morgan's calls are in line with a survey by the British Chamber of Commerce (BCC), which found that 36% of small and medium sized firms believe the "most important thing" the government can do is incentivize energy efficiency installations through grants. "Most SMEs know what energy saving measures they could and should put in place, but the upfront costs are a massive disincentive," Mr Morgan said. "In face, 15% of those businesses surveyed felt the energy savings would not prove beneficial to the installation costs. "The government provides financial incentives to big energy suppliers to implement low-carbon policies; SMEs deserve similar financial support so they can put in place the equipment they need to reduce their energy consumption. "This equipment would obviously benefit from their bottom line, as well as the planet, but the up-front costs are prohibitive for many small firms, who already struggle with their cash flow and profitability. "It would make sound financial and environmental sense for the government to help firms with the initial costs of doing something that would benefit all stakeholders." The BCC survey, carried out in partnership woth Big Six supplier British Gas, involved more than 2,100 British businesses - 91% of them SMEs. The survey revealed that businesses are already aware of what energy measures could be put in place, with only 8% requesting more information. In total, 15% of those surveyed felt that the energy savings would not be worth the investment. More than a quarter of businesses that currently rent their facilities and premises revealed they have no influence on energy efficiency improvements. In light of the finding, the BCC called on landlords to do more for leaseholders that were 'looking to save money and make their energy work for them'. 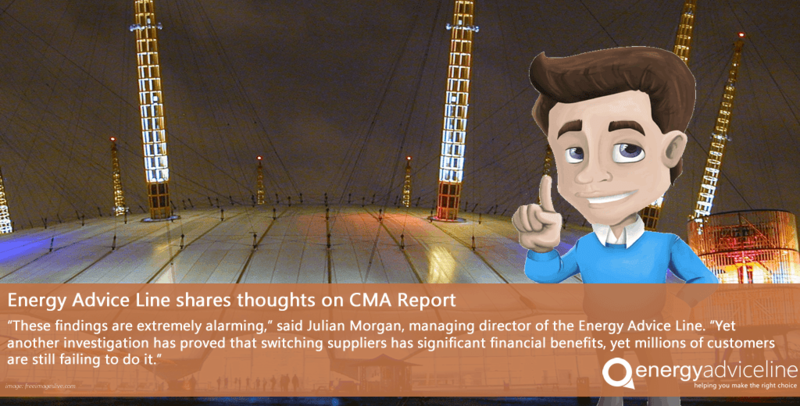 Mr Morgan added that SMEs keen on cutting their energy costs should regularly chase the best deals and switch suppliers. "There's no expensive upfront investment required, and it's quick and simple - there aren't many ways to save significant amounts of money that are this easy," Mr Morgan said. 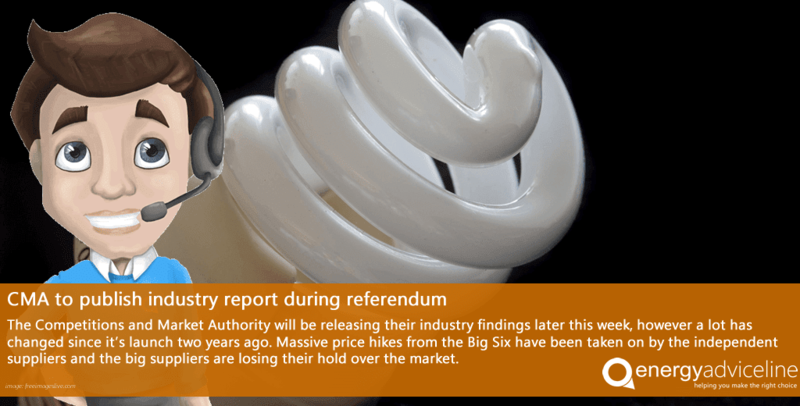 The latest report by the Competition and Markets Authority (CMA) showing more than 70% of energy consumers had never switched tariffs, was of grave concern, according to the Energy Advice Line. A survey of 7,000 domestic energy customers carried out by the CMA as part of its probe into the energy market, also found that more than one-third of respondents had never considered switching supplier. This was despite the fact that customers of the Big Six energy companies could have saved hundreds of pounds by switching to a rival firm. "These findings are extremely alarming," said Julian Morgan, managing director of the Energy Advice Line. "Yet another investigation has proved that switching suppliers has significant financial benefits, yet millions of customers are still failing to do it. "Urgent action is now needed to persuade customers - in the strongest possible terms - to shop around for their energy, just as they do for all their other significant household purchases. "Failing to do this is costing them considerable sums of money that most people simply can't afford to lose." The report found that dual fuel customers of the Big Six suppliers could have saved an average £164 per year by switching over the previous three-and-a-half years, and in some cases as much as £245. The report pointed out that the potential savings from switching had risen substantially over the past two years, in some cases (depending on tariff) of £330 annually. Mr Morgan welcomed the report's finding that third party internediaries, such as the Energy Advice Line, "significantly reduce search and switching costs for domestic customers by providing an easy means to gain personalised quotes, on a comparable basis, from a range of different suppliers." But he rejected one of the report's recommendations for a national database of customers who had not switched over the past three years. This would see rival firms send their deals to the listed customers in the post. "This would be a nightmare for consumers, who would be inundated with confusing offers from rival suppliers desperately competing for business," Mr Morgan said. "This would not help consumer engagement with the energy market, and could well have the opposite effect - all their communications could end up being ignored. "As the CMA says itself, independent and reliable services like the Energy Advice Line are the quicklest, easiest and cheapest way to shop around for the best deals and change suppliers." The Energy Advice Line is one of the UK's leading price comparison and switching services for business and domestic energy customers. It is also an advocate for energy market reform and has campaigned for a better deal for energy users, including callling for a ban on cold calling and changes to regulations to make it easier for all consumers to switch suppliers. 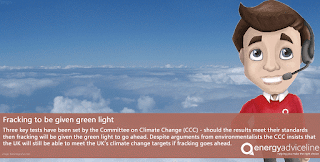 Three key tests have been set by the Committee on Climate Change (CCC) - should the results meet their standards then fracking will be given the green light to go ahead. Despite arguments from environmentalists the CCC insists that the UK will still be able to meet the UK's climate change targets if fracking goes ahead. Emissions should be strictly limited during shale gas development, production and well decommissioning. The CCC says this needs tight regulation, close monitoring of emissions, and rapid action to address any leaks. Overall gas consumption in the UK must remain in line with UK carbon budgets – so UK shale gas must displace imported gas, rather than increasing gas consumption overall. Emissions from shale gas production must be counted as part of the UK’s carbon budgets, and emissions in another part of the economy may need to be cut further in order to accommodate fracking. Many believe that the potential results from fracking in the UK have been over estimated for some time, and there are a number of uncertainties about the projections from the CCC and the government. There is currently no production of shale gas within the UK. Fracking hasn't taken place in the UK Since 2011 - anti-fracking campaigners have applied for judicial reviews on the decision with concerns for climate change. Dr Doug Parr, chief scientist at Greenpeace, said: "The idea that fracking can be squared with the UK's climate targets is based on a tower of assumptions, caveats, and conditions on which there is zero certainty of delivery. "The problem with ramping up a whole new high-carbon infrastructure and the fossil fuel vested interests to go with it is that you can't just dial it down later on if emissions start going through the roof." Which supplier is under review now? 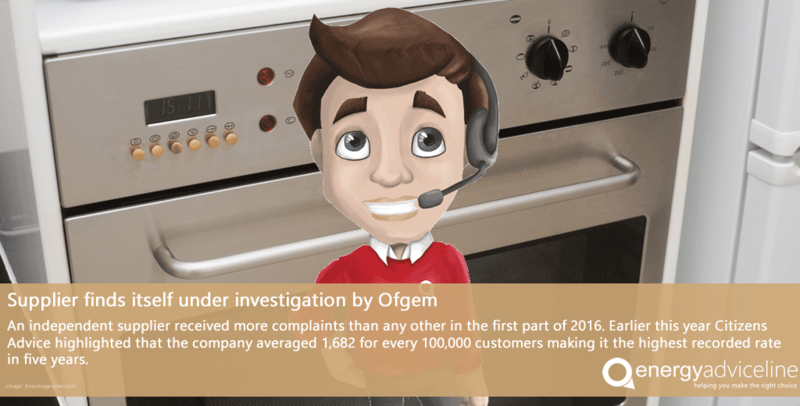 Customer complaints have forced energy market regulator Ofgem to conduct an experiment into one of the suppliers outside of the Big Six. Usually it's one of the Big Six being investigated off the back of a high number of complaints - this time it's the turn of Extra Energy to be examined whether or not the supplier broke the rules on billing, customer service and complaints handling. Looking back over the past five years, it has been found that Extra Energy received more complaints than any other supplier. Earlier this year Citizens Advice highlighted that the company averaged 1,682 for every 100,000 customers making it the highest recorded rate since 2011. The company have assured Ofgem that they have since improved their customer services, making multiple changes including hiring 150 extra staff, relocating their offices to Birmingham, creating tamer sales pitches, and reducing call waiting times to an average of 45 seconds. Extra Energy attribute part of the problem to the growth of the company happening too quickly for them to cope with. 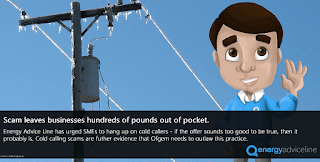 Ofgem's investigation is currently underway, however if they do find that Extra Energy has broken rules regarding customer handling then they will face a fine to the sum of 10% of it's annual turnover. 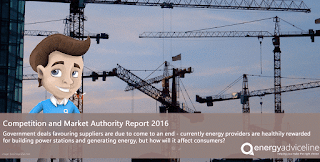 The Competition and Market Authority released their industry report last week. Despite the EU Referendum stealing the headlines, there is news that could be positive for the consumer. Government deals favouring suppliers are due to come to an end - currently energy providers are healthily rewarded for building power stations and generating energy. Often there is a set price for each unit of energy generated and this money goes towards the construction of infrastructure, usually an expensive implementation. However, these prices not only come from public money as a levy on bills but are also exceeding the current market rates. While it costs an additional £11 to every home owner's bill, annually it adds up to £310m. The CMA have put forward a recommendation that these deals should be awarded through auction, in turn saving the Government and consumers millions of pounds - in turn reducing their bills. It's fair to say that publishing any kind of report on the day of the EU referendum means it will promptly be overlooked in favour of other news. The Competitions and Market Authority will be releasing their industry findings later this week, however a lot has changed since it's launch two years ago. Massive price hikes from the Big Six have been taken on by the independent suppliers and the big suppliers are losing their hold over the market, but we're not safe from price hikes yet. There will be four key pillars to the report on Thursday and speculation is well under way as to what the outcome will be. Scale - CMA agrees that households are paying too much, and suppliers are still standing by their claims that the figures are 'nonsense'. Price caps - one proposal is for customers with pre payment meters to receive a price cap, as these consumers are the most likely to be excluded from the best deals on the market. Spam - a new database has been created from the details of customers who have not switched for three or more years, highlighting the importance and ease of switching. Needless to say, suppliers aren't keen on giving away their customer's data so suppliers can undercut them. Tariff restrictions - this will enable suppliers to offer exclusive deals to new customers, while excluding existing customers from receiving the benefits. Time will tell what is to become of the CMA report, in the meantime our advice remains the same - searching the market for the best deals will always be the way to ensure you're getting the best price on your energy spend. The service with energyadviceline.org.uk is always free and impartial, taking the hassle out of switching and saving. 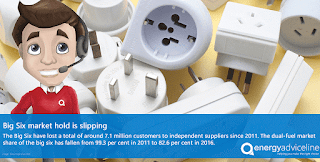 New research shows that one in six energy customers are now actively choosing an independent supplier. This has grown from one in eight dual-fuel customers over the past year and is predict to grow still. 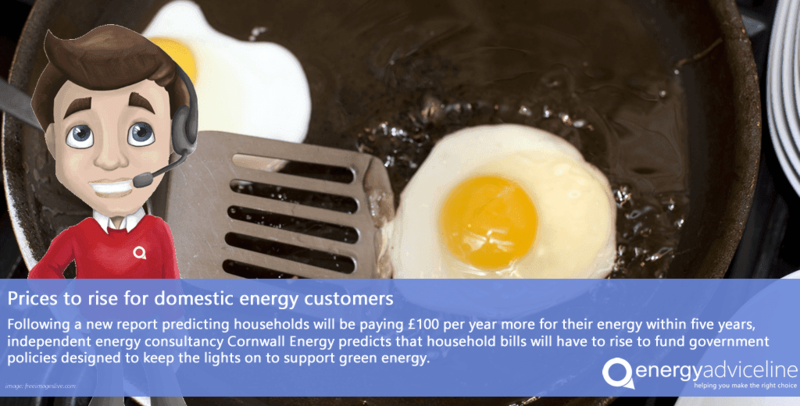 Cornwall Energy conducted a survey finding that 17.4% of dual-fuel customers now received their supply from independent suppliers, such as themselves. Robert Buckley, director of Cornwall Energy, said: "This data shows one of the biggest shifts to independents in the past 12 months." The Big Six consists of British Gas, EDF Energy, npower, E.ON, Scottish Power, and SEE. Combined they have lost a total of around 7.1 million customers to independent suppliers since 2011. The dual-fuel market share of the big six has fallen from 99.3 per cent in 2011 to 82.6 per cent in 2016. Aloing side this new research from Which? has found the cost gap between the cheapest dual fuel tariff and a standard dual fuel tariff from one of the so-called 'Big Six' suppliers has soared up to 81% in the last two years. The cheapest dual fuel deal available has increased from £182 to £329 since 2014. At one point during its research in February 2016, Which? found that people on standard tariffs could save £400 a year by switching away from the Big Six suppliers to the cheapest tariff. A standard tariff is what you are moved onto once your energy deal comes to an end, but these tend to be very expensive. Millions are thought to be on these tariffs with the Big Six and paying much more than they need to. Make sure that the price you're paying is fair, use an independent price comparison service such as energyadviceline.org.uk - and make the most of the free switching service and account management. Labels: big six, cornwall energy, independent suppliers, survey, which? The Energy Advice Line has urged small and medium sized firms to hang up on cold callers offering to help them with their energy bills after an investigation was launched into a scam that leaves businesses hundreds of pounds out of pocket. Julian Morgan, managing director of the price comparison, switching and advice service, said the swindle was further evidence that Ofgem should outlaw cold calling. “The investigation into this fraudulent activity highlights what we have been saying for some time: businesses need to avoid dealing with cold callers,” Mr Morgan said. “The majority of cold callers are not fraudsters, of course, but for many reasons it’s better to politely hang up on unsolicited callers offering cheap energy deals or anything else to do with their energy supplies. “Cold callers are unlikely to be offering the cheapest deals on the market because they are often calling on behalf of a particular supplier, despite what they say to the contrary. “Worse, they could be fraudsters trying to steal your money. Trading Standards officers in Nottinghamshire have launched an investigation into a company that targets pubs, cafes and takeaways offering to claim back up to £6000 on their utility bills. The fraudsters, operating under a number of company names, arrange for “auditors” to review a business’ energy bills and then persuade the owners to sign an agreement to claim back money. The signed-up business later receives a telephone call purporting to be from their energy supplier, who apologizes for overcharging them. The fraudsters complete their scam by persuading the business to sign a contract that contains a £325 fee in the small print. “If it seems too good to be true, it probably is, and this applies to getting money back from energy companies or basic energy deals,” Mr Morgan said. “If you believe you might have been overcharged for your energy – and this does happen due to malfunctioning meters or billing mistakes, contact your energy supplier directly. New plans revealed from the Competition and Market Authority (CMA) show tactics that could potentially overwhelm customers, create unneccesary confusion and harass customers. The scheme shows that the regulator will allow suppliers to contact customers who are failing to switch, Ofgem has warned that this idea could "overwhelm". The CMA has also proposed to relax rules surrounding price comparison sites. With the aim of boosting competition in the market, this move could end up costing homeowners as much as £70 per year, despite many already overpaying currently. However, a selection of the smaller, independent suppliers have contacted energy secretary Amber Rudd with their concerns that it would only benefit the 'Big Six' suppliers - as well as advising that the plan itself will backfire and leave homeowners worse off in the end. Suppliers speaking out against the review are GB Energy Supply, COOP Energy, Go Effortless Energy, Bulb, So Energy and Zog Energy. They are increasingly worried about the consumers understanding of the market, "millions of people go to price comparison websites believing them to be transparent shop windows for the cheapest prices rather than 'brokers' in an increasingly skewed market." Final recommendations are due to be published by the CMA in June. Since 2010 the market of energy suppliers has grown from just 13 to over 40 - with independents taking up 15% of the dual fuel market (previously only holding 1% share). Energy Advice Line always believes in providing the best service for the customer, and always endeavour to deliver the best price based on the needs of the consumer. Price comparison is always fair, unbiased, quick and easy - the switching process, from start to finish, is all handled by the contract management team. Any questions, no matter how big or small, will be handled quickly and efficiently, leaving you more time to run your business and continue with life.